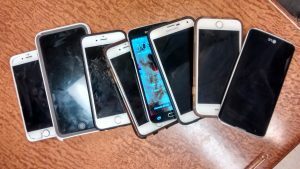 There’s a plethora of ways to limit your students’ use of cell phones, and sometimes it comes down to confiscation. I have used this technique for over seven years for confiscating student cell phones with relatively high success rate and relatively low disruption to class. The heart of this technique is the “broken record” technique. I use the line “Phone, please” (or nowadays, I may just put my hand out). Your demeanor should be calm and neutral. Make sure you’re not teeth-gratingly-angry-beneath-a-fake-calm-exterior. Do not smile or act pleasant, as (depending on your personality with the students,) the student may think you’re playing around and might play around in return. Convey that you’re serious but not upset about collecting their phone. If you’re not sure how to act “neutral”, act bored. Let’s assume the student does not give you the phone (*gasp!*). Repeat the request… repeatedly. Repeat the request. This is the “broken record” part. No matter what their reply/retort/objection is, you simply repeat your request in the same neutral tone. I know it doesn’t sound very exciting, but the priority here is to have possession of the student’s phone with as little disruption to the class, with as little stress and mental effort on your part. No tricks, no witty comebacks. Do not escalate your emotions. Do not appear to become more annoyed, frustrated, angrier, or more demanding with subsequent requests. Resist the temptation to duel with the student. Oftentimes students will retort instead of giving you the phone (“I was just checking the time.”, “Fine, I’ll put it away.”, “You never told us you’d take our phone.”, etc.) It doesn’t matter if you have the perfect reason/lesson/comeback for what the student says. Sometimes students will instead put the phone away, hoping I’ll accept that as a substitute for confiscation. I do not accept that, as it tells the student that they don’t have to abide by my consequences, that they can make up their own alternatives or bargain their way out of the expectations they were aware of. I repeat my request. Present the “ultimatum” as two neutral options in which you have no stake in. Present the ultimatum in a way that does not sound like you’re making a threat (Bad example: “Give me the phone or I’ll send you to the office.”). If the student perceives you are threatening them, they may be more likely to keep the phone out of spite. It’s not about “you win” or “they win”, it’s merely a decision that they need to make. When/if they give me the phone, I say “thank you” (and store the phone in a safe location). If the student decides to keep the phone, I neutrally follow through with the course of action they chose, without conveying anger, disappointment, etc. I presented them two options and allowed them to choose. They chose. There was no implication that that choice came with “and your teacher is going to be real pissed at you for choosing this option.” Your rules, consequences, and consistency – and not your emotions – send your message. My cell phone policy is that you may not use your phone in class unless I give you permission. If I see you using your phone, I will ask for it. I will not give you any warnings. It doesn’t matter what you’re using it for, whether you’re checking the time or using it as a mirror. If I see it, I may ask for it, so your best bet is to just keep it out of sight. If I do collect your phone, I will keep it until the end of class. Your priority is that students exhibit the desired behavior because they understand the rationale and consequences. The spirit of this is not “gotcha!”. By starting small and never escalating emotions, you keep the stakes low, and you avoid drawing the attention of the class. You are not playing chicken. By having a straightforward plan of action, you remove the unknown. Many of us are hesitant to try something because “what if?…”. In this case, all the “what ifs” are answered by having a system to follow. You do not have to make decisions or verbally “spar” with the student. When you notice the target behavior, you deploy the procedure, then continue class. You are like a robot following a program. You are not thinking on your feet, reacting to the student’s actions or emotions. There is no emotional investment (stress/anxiety/frustration). The system reduces the student’s opportunity to deflect the conversation and further distract the class. This is done through keeping the interaction focused on the requested action. I return the phone at the end of the period. I’m likely to get more resistance if I keep it until the end of the day. I find the importance is not so much in the severity of the consequence as much as in the consistency of the enforcement. If a ringer or notification goes off, I tell the student to just take out the device, turn it off, and put it back away. Ringers accidentally going off in class have been rare and I don’t consider them as a behavior issue that calls for confiscating the device. I use this technique for only very routine things students already know the rationale behind. Every student already knows there is no reason for them to use their phones in my class unless I say otherwise. In cases outside of this, students can be confused about why you’re asking them to do something or they may genuinely feel it is not fair (as opposed to just trying to get away with breaking rules). In such cases, you might be open to having a discussion with the student as opposed to just be focused on compliance. A common objection is “I have unsupportive admin so there’s no point in sending a student to the office.” The “ultimatum” doesn’t have to involve sending the student to the office. It just needs to be an option in which the student rather just hand over the phone (or keep it out of sight) in the future, rather than repeatedly face that other option. DO NOT… Assume a student is using her phone. I confiscate a phone only when I directly see the student using her phone – and almost always the student knows I saw it so there’s rarely a debate that goes like “I wasn’t using my phone! I didn’t even have it out!” – which if you didn’t actually see her using it, she may actually be speaking the truth. There’s nothing to cause bitterness against a teacher like being punished for something you didn’t do. Even if you didn’t see it but you are absolutely certain they were using their phone, a different dynamic may play out if the student knows you didn’t actually see the phone. If they were just quick to hide the phone before I saw it, at least they respect my system enough to not want to get caught. DO NOT… Improvise/escalate by impulsively changing the consequences. A clearly communicated and consistently enforced system allows students to practice making good decisions. Switching up the system impulsively allows students to practice distrusting you (and possibly other adults). 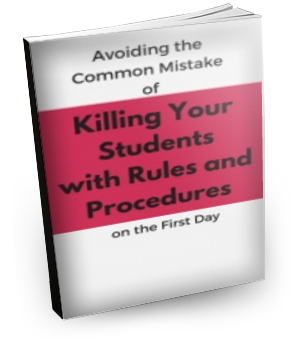 My biggest fear in enforcing rules was if a student reacts in some extreme manner. First, you greatly reduce the risk of extreme behavior by attempting to neutrally enforce a very reasonable policy and consequence the student knew about ahead of time. If you follow the system and remain neutral, your student is less likely to take it personally. They may be mad at your system, but if you escalate your emotions, that may give them reason to be mad at you, and further risks damaging your relationship with the student or fueling emotional flames that lead to extreme behavior. Most of my students who use cell phones in class are willing to push the boundaries enough to give some backtalk but not enough to risk facing the consequences for blatant defiance. When faced with a decision in a rational state of mind, these students are less likely to choose the more severe consequence. By using impromptu threats and not making the policy clear ahead of time, you put the student in a situation of making this decision on emotions charged with rage, indignity, spite, etc. This greatly increases the risk of the student making a decision they will later regret. “Yeah, but what if things do escalate?” I realized my fear was of the unknown. The student could behave in so many ways that I wouldn’t know how to react to them. Here’s how to react: Stick to the procedure. Even if extreme behavior pops up (“Give me the phone, please.” “F@%$ you!”), stick to the procedure (“… Give me the phone, please.”). If the behavior is that extreme, treat it as a separate issue that you can address later after giving it some calm and reasoned thought. It’s probably best to deal with it later anyway (after class, next day – of course assuming it’s nothing that concerns the immediate safety of anyone). Even if this technique does not result in confiscation 100% of the time, it reduces the undesired behavior from the rest of the class, as well as likely reduces additional incidences of extreme student behavior. As long as you follow through on your end, it shows other students that you follow through. Even though it might not get the most extreme students, most students do not want to get sent to the office (have parents called, etc) over a relatively minor scuffle. For my cases that were sent to the office, even when no severe “punishment” resulted, the students did not seem to think it’s worthwhile putting up the same fight in the future (I never had to send a kid to the office more than once). Even if these students thought it was worthwhile, other students notice that I do enforce my policies and they are less likely to use their phones in class. I have an average of one incident per day, and out of all these, I have never had to send more than one student to the office per year. Of course, your mileage may vary based on the myriad of variables between my classes and yours. There are countless ways to respond to the situations addressed here. The system as presented is prioritized to be simple, straightforward, and require the least amount of distraction to you (especially for newer teachers or any teacher wrestling with classroom management). This technique applies not just to confiscating cell phones, but many other basic actions we may ask of students, such as to change seats or take off their hat (but it’s not for asking students to stop doing something, like stop talking). In the end, it is about having control over your classroom atmosphere so that you can make it an environment you believe is conducive to student learning. Both teachers and students want the teacher to have control over the learning environment. Have you tried this or something similar? What worked? What didn’t? What other situations have you had success with using this technique? What are things you might need to do differently to make it work for your situation? You are an idiot for thinking its a good thing to take items that are not yours. Thank you for your thoughtful ideas and presenting your approach. I’ve had students come at me quite aggressively for attempting to confiscate their phones. Do you have any particular thoughts on when the student chooses to escalate the situation despite a calm demeanor on the part of the instructor? I hate having to call security for something that should be so trivial. The ability of instructors to confiscate a distracting item is clearly outlined in the student code of conduct of a school. If you’d like to get more technical, an instructor additionally has the right to do this by loco parentis; this confers the rights of a parent of a minor child to an educator acting as such in the absence of the student’s legal guardian(s). All of this is written with the assumption that the student will choose to escalate. :o) In this case, the teacher is choosing to escalate through a consistently enforced system that students supposedly knew of ahead of time. As much as possible, the teacher should convey it as such rather than a personally directed power trip through escalating threats. The way I see it, if it comes to the point of calling security, the student had consciously made that decision after weighing the two options – if the teacher did indeed execute with a calm demeanor, it is much less likely the student is choosing to have security called out of spite to the teacher. Security was not called for the student using the cell phone – they were called for the student’s repeated denial to hand the phone over (and as you mentioned, I believe in most districts confiscation is entirely in compliance with policies).